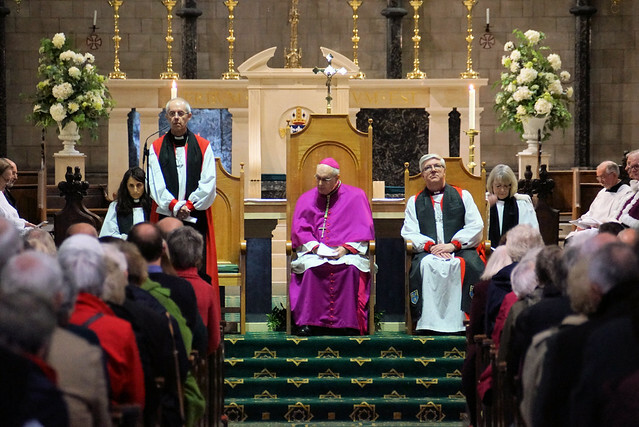 The Archbishop of Canterbury Justin Welby was welcomed to Norwich at an historic ecumenical service of welcome at St John the Baptist Catholic Cathedral on Wednesday. Keith Morris reports. Archbishop Justin was welcomed by the Catholic Bishop of East Anglia and the Anglican Bishop of Norwich, alongside many other local church leaders in a short midday service of reconciliation. It is believed to be the first time any Archbishop of Canterbury has spoken at St John’s Cathedral. The service marked the start of a three-day visit to the Diocese of Norwich by the Archbishop, which will also include King’s Lynn on Thursday and Great Yarmouth on Friday. The service included readings and prayers on the theme of reconciliation. There was a three-fold act of confession in the light of our failure to be ‘one’ by the bishops and archbishop. In his reflection, Archbishop Justin said: “There are only three problems with divisions in the church according to Scriptures: it deeply impedes our prayers; it hinders our experience of the grace and love of God and it ruins our witness to the world. Apart from that it is all upside. “In North America they have estimated that there are over 36,000 different denominations of churches and the number is going up rapidly. “Jesus’ call to the church is to love one another and to be united,” said Archbishop Justin. “The churches’ answer to a divided world must be an example that comes from the unity of God in Christ that he has given us. Unity is not an added extra for the church. It is an inescapable duty and obligation. “We are united when we serve together in the foodbank or debt counselling or when we help the person sleeping rough. “What is normal is a deep and abiding love for one another. We see an example of unity in this diocese in the relationship between Bishop Alan and Bishop Graham and between Catholics and Anglicans and other churches. I praise God for that and may it be an example that spreads further,” said Archbishop Justin. Ecumenical guests included leaders from Orthodox, Methodist, Baptist, and United Reformed churches, the Salvation Army, Quakers and free churches. After the service Archbishop Justin began a tour around Norwich attending a service at Norwich Synagogue, talking to young people and staff at YMCA Norfolk, helping serve lunch at St Stephen’s Church Café, chatted with the leader of Norwich City Council and Norwich market traders before visiting Revelation café for a book reading and then onto Norwich Anglican Cathedral for further services on the theme of reconciliation. You can follow more at the Diocese of Norwich blog https://blog.dioceseofnorwich.org/. Listen to Archbishop Justin and Bishop Alan on the BBC lunchtime news. Start at six minutes in. Click here or below for a full picture gallery of the Ecumenical Service at St John’s Catholic Cathedral.